Millions of people take to the streets to demand the impeachment of the first woman to be elected president in the country's history. Protesters condemn corruption scandals involving the largest national companies. The leading party loses support, and has its structure shaken. The impeachment process, the second in the country's young democracy, casts shadows over the president's political mentor, who is considered by a large segment of society to be one of the greatest leaders the country has ever had. The scenario outlined above could represent either Brazil or South Korea in 2016. Like Dilma Rousseff, Park Geun-hye has been impeached by parliament. The ousted Korean president awaits trial, which is expected to take place in the beginning of 2017, while the unpopular Prime Minister Hwang Kyo-ahn serves as acting president. There are significant differences in the political profiles of both former leaders. 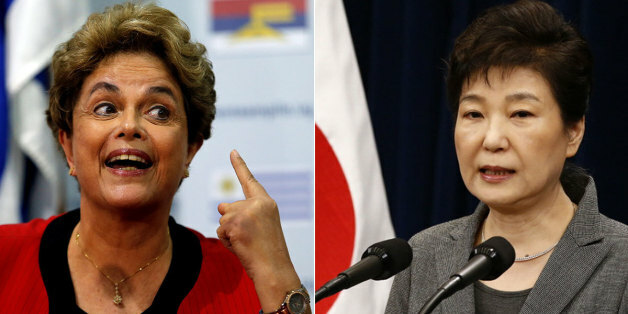 While Dilma took part in the guerrilla movement against the Brazilian military dictatorship, Park is the daughter of general Park Chung-hee, the dictator who ruled South Korea for almost 20 years. Park was elected amid nostalgia for the authoritarian period, when the country experienced rapid economic development. Her campaign also took advantage of her dramatic personal history -- her father was killed by the head of the secret service as part of an attempt to overthrow the government, and her mother was killed by North Korea supporters. In Brazil, the impeachment was part of a longer crisis, which included the deterioration of the economy and the rise in fiscal imbalance over Dilma's first term, the tense 2014 presidential elections, and the unfolding Operation Car Wash investigation into the corruption scandal at the state-run oil company Petrobras. The president gradually lost her popularity, and conflicts with her allies made her lose the support of the majority in congress. Although it is still early to draw solid conclusions about South Korean politics, the country's general mood is one of satisfaction, unlike in Brazil. Dilma's impeachment was prompted by "fiscal maneuvers," which are basically illegal accounting maneuvers to hide the true size of public debt. The protests against the president were motivated by the corruption scandal and dissatisfaction with her economic policy. In South Korea, Park's impeachment started with her relationship with the businesswoman Choi Soon-sil, her childhood friend, and the influence that Soon-sil had over the presidential decisions. Korean tabloids suggested that this scenario resembled more closely Tsarist Russia and Rasputin than the image of a modern globalized state that South Korea tries to convey. Choi Soon-sil's father was the leader of a the cult-like Church of Eternal Life, which combines elements of Christianity, Buddhism and shamanic rituals. After the murder of General Park's wife, he became extremely conservative, and turned to the Choi family for spiritual guidance. Following the dictator's death, the influence that the Choi family had over the young Park Geun-hye grew stronger. As she gained political power, this influence generated a network of favors and suspicious businesses. In 2016 the press accessed a tablet that contained conversations between Park and Choi, and they found out that the businesswoman had access to classified official documents and controlled several aspects of the president's life, including her speeches, wardrobe choices, and the events she appeared at. The image of Park as a puppet in a pagan cult spread rapidly across the country. Investigations proved that Park and Choi kept suspicious relations with the chaebol, the large Korean family businesses. The presidents of companies such as Samsung, LG, Hyundai and Lotte came before parliament to testify to a web of corrupt deals that the president and her friend had orchestrated. For example, Choi's daughter used her family's political power to graduate from one of the country's most prestigious colleges despite attending less than half the mandatory classes and without sitting for the necessary exams. Korean feminist groups have pointed out that the opposition to Park was not due to her gender, but rather to her political actions. Amid extreme polarization and the heated debate, many Brazilians who were opposed to Dilma Rousseff's presidency spouted sexist statements targeted at the president. It is not possible to say that gender issues have been central to her impeachment, but they clearly surfaced in the protests, unlike what happened during the impeachment of Fernando Collor, for instance. Considering that patriarchy is still prevalent in South Korea, gender issues were also strongly present during the protests. Many people called Park a "princess disconnected from reality" and considered the fact that she was single to be immoral. However, Korean feminist groups have pointed out that the opposition to Park was not due to her gender, but rather to her political actions. The two presidents had very different reactions to their impeachment. Dilma called it a coup, and she still has many supporters. Park, on the other hand, apologized to the nation, acknowledging part of the accusations against her and, "with a heavy heart," accepted whatever destiny the parliament decided for her. Dilma's impeachment didn't solve the Brazilian political crisis. Currently at stake is the party system that had been built since Brazil's redemocratization. The ongoing corruption scandals, the attempts by the congressmen to protect the politicians involved and the deepening of the recession are serious concerns of the Brazilian population amid the controversial measures proposed by president Temer, such as freezing public expenditures for 20 years and a new social security reform. This year's municipal elections -- the first after the impeachment -- had a devastating impact on the Workers' Party, which was expelled from the largest cities. Further, smaller parties were successful in some state capitals, and the PMDB faced significant defeats -- which is all indicative of a period of high instability until the next presidential election. Although it is still early to draw solid conclusions about South Korean politics, the country's general mood is one of satisfaction, unlike in Brazil, where there is sizeable opposition to the impeachment. The Korean conservative party, Saenuri, lost popular support and the Democratic Party, DPK, gained momentum and will probably go on to win the 2017 elections. The current debate in South Korea is over the unclear relations between the private and public sectors, which go back to the military period. How can they change these structures? This post originally appeared on HuffPost Brazil and has been translated into English.